Vincent Floderer, Boom!, 2000. Wenzhou calligraphy paper, watercolor, Indian ink on wood frame with glass. Photo © Mingei International Museum, Gift of the artist. The Japanese American National Museum will premiere the new exhibition “Folding Paper: The Infinite Possibilities of Origami,” a thought-provoking and interdisciplinary look at the modern advances of origami through contemporary artworks, inventions, and videos. 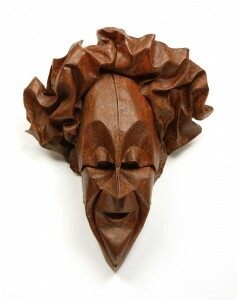 Eric Joisel, Mask, 1999. Paper, folded wet and coated, on wire. Photo © Mingei International Museum, Gift of V'Ann Cornelius. “Folding Paper,” organized in partnership with Washington, D.C.-based International Arts & Artists (IA&A), is on view at JANM, 369 E. First St. in Little Tokyo, from Saturday, March 10, through Aug. 26. Dynamic, innovative, and exquisite — the art of origami, or paper folding, exceeds the boundaries of craft. This collection presents origami as a sophisticated fine art form exhibited in museums and sought after by individual art enthusiasts. Even more remarkable, origami today inspires concepts in math and design, and inventions in engineering, architecture, and technology. The origami crane has even become a symbol of the global peace movement — all a far cry from the simple folded animal forms loved by children. The first major exhibition to explore the rich history of paper folding both in Japan and Europe, “Folding Paper” features approximately contemporary 150 works by more than 40 international artists from 16 countries. This examination of paper as a medium for endless creativity also includes origami-related woodblock prints, murals, videos, an interactive origami-making station and — sure to please young and old alike — an origami dome tent that visitors may enter. 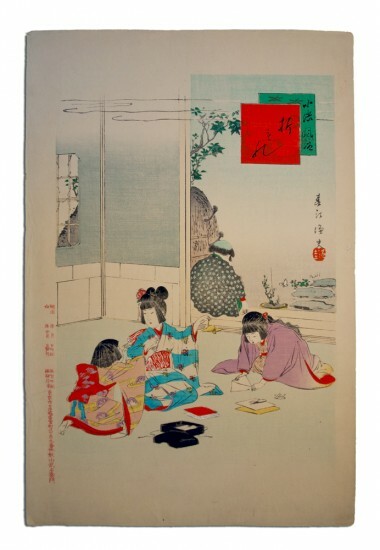 • “Folding Paper” has four sections, beginning with “History of Origami.” Paper was introduced to Japan via China around the 6th century AD and Japanese paper folding is assumed to have begun shortly afterward. 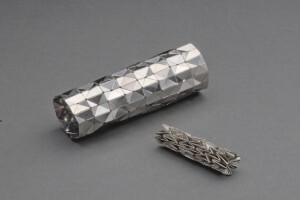 Most likely rooted in the ceremonial world of the native Shinto tradition, the earliest folded paper objects were the zigzag strips of folded white papers known as shide used by priests to perform purification rituals. Gifts given among the upper class were often wrapped in decorative folded paper. Robert J. Lang. Emperor Scorpion HP, opus 593, 2011. One uncut square of Korean hanji paper. Photo © Robert J. Lang. Yoshizawa Akira (1911-2005) is credited with elevating origami to an art form. He developed thousands of new designs and pioneered the art of “wet-folding,” a technique that allows for the sculptural modeling of details. By the 1950s, his work was featured in numerous publications and in 1954 his book “Atarashii Origami Geijutsu” (New Origami Art) propelled him to fame. In this book, Yoshizawa introduced a system of notation for origami folds, which has since become the worldwide standard for paper-folding instruction. The same year, he founded the International Origami Center in Tokyo and began holding origami exhibitions overseas, serving as a cultural ambassador for Japan. Yoshizawa would later write 17 more books on origami, and in 1983 Emperor Hirohito awarded him the Order of the Rising Sun, a highly prestigious decoration. • “Animals and Angels: Representations of Real and Imagined Realms” illustrates how some origami artists create realistic works while others are more stylized. 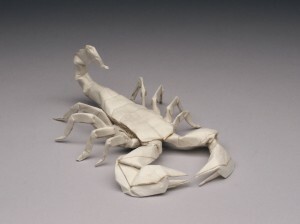 Many contemporary origami artists have transcended the traditional flat, angular representations of animals and humans and use specially made paper to enhance textural richness. Daniel Kwan, Six Interlocking Pentagonal Prisms, 2010. 90 rectangles of paper. Photo © Shue-Yu Kwan. 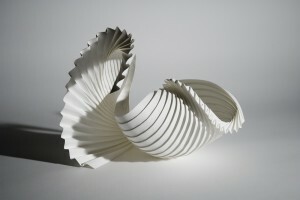 Eric Joisel and Michael LaFosse, in particular, have adopted Yoshizawa’s wet-folding technique — which enables the smoothing and rounding of points and angles — so skillfully that their figures appear chiseled rather than folded. 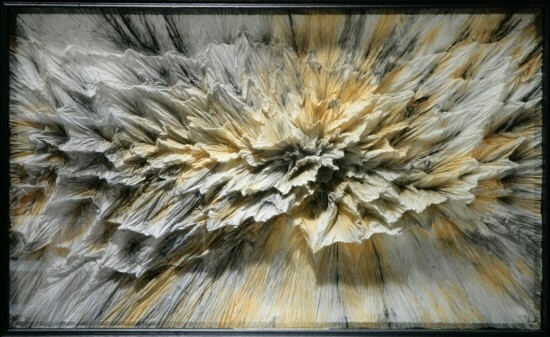 Vincent Floderer uses unconventional techniques and materials such as crumpling paper napkins to achieve a textural naturalism, while the subtle abstraction of Giang Dinh’s barely folded figures and Paulo Mulatinho’s delicate crane endow the works with great spirituality. The complexity of the natural world has inspired some artists to fold increasingly complicated creatures out of single squares of paper. • “Angles and Abstractions: Geometric Forms and Conceptual Constructions” highlights origami’s mathematical roots through modular objects and tessellations. Typically, modulars are geometric structures but can also be as diverse as the twisted floral forms of Krystyna and Wojtek Burczyk and Heinz Strobl’s paper strip spheres. Recently, many artists have been exploring origami tessellations, in which a pattern fills a plane with no overlaps or gaps, like decorative wall tiles. Artists Eric Gjerde, Christine Edison, Joel Cooper and Linda Mihara are able to transcend the normally two-dimensional nature of these forms and create three-dimensional works. Richard Sweeney, 03M (Partial Shell), 2010. Watercolor paper, wet folded. Photo © Richard Sweeney. More conceptual pieces are also displayed in this section, such as the dynamic sculptures by Erik and Martin Demaine and Richard Sweeney. Paul Jackson’s abstract works are either created by a single fold, or folded and then allowed to unfold themselves into new, organic structures. • “Inspirational Origami: Impact on Science, Industry, Fashion and Beyond” explores the transformative power of modern-day origami. 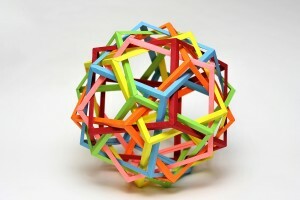 Origami, mathematics, science and design have become increasingly interconnected. Origami is not only used today to explain and teach arithmetic, but computational origami employs algorithms and theory to solve complex problems. Airbag logistics, space telescope lenses, cell phone design, architectural design, and even heart stents have their basis in origami principles and all are displayed in this section. For example, Dr. Robert J. Lang is a scientist and mathematician who formerly worked with NASA’s Jet Propulsion Laboratory at the California Institute of Technology. In 2000, he was approached by Lawrence Livermore National Laboratory to help develop their Eyeglass Telescope, which would be 40 times larger than the Hubble telescope. Lang used computational origami to determine how to fold the lens so that it could be launched compactly and then re-opened in space. The resulting design used an origami structure he called the “Umbrella” after its resemblance in the furled state to a collapsible umbrella. Lang is both an advisor for the exhibition and a participating artist. “Folding Paper” is a dynamic exhibition with a compelling message: origami is an international fine art form that is also at the cutting edge of math, science, and design. 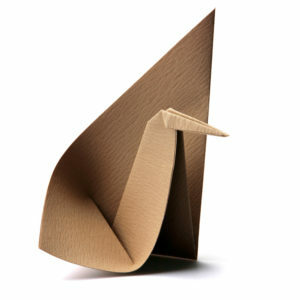 JANM has used origami as a hands-on activity for student visits and its extremely popular Target Free Family Saturdays. Besides teaching visitors to make more traditional forms, such as cranes and boxes, museum volunteers also invented a more contemporary piece that resembles a polo shirt. In addition to JANM, the exhibition will be shown at the Leigh Yawkey Woodson Art Museum in Wausau, Wis. (Jan. 26 to April 7, 2013); the Crocker Art Museum in Sacramento (June 22 to Sept. 29, 2013); and the Peoria Riverfront Museum in Peoria, Ill. (Jan. 31 to April 27, 2014). For an updated tour schedule, visit http://artsandartists.org/exhibitions/origami.html. “Folding Paper” is curated by Meher McArthur, an independent Asian art curator, author and educator. She is the former curator of East Asian Art at Pacific Asia Museum in Pasadena, where she remains a frequent guest curator, and is author of a number of books on Asian art and culture.